Bingo is a form of gambling that has largely been overlooked by the makers of slots. 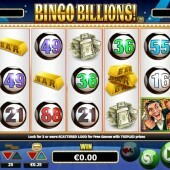 However, NextGen Gaming have decided to set the record straight with a bingo themed slot called Bingo Billions!. Personally, I have fond memories of being a young kid with a Gran from the Welsh valleys who regularly spent her evenings down at the local bingo hall. These memories were particularly nostalgic whenever she'd win large sums of money! Bingo Billions! is a 5 reel, 25 payline slot that takes you into the heart of the bingo halls and brings the drama, intensity, and excitement of the classic gambling game into your living room and onto your slots schedule. Symbols on the reels will be familiar to anyone that has visited a bingo hall or played bingo in an end of term mathematics lesson in school. There are the bingo cards, wads of cash, bars of gold, and a selection of bingo balls including 88 (two fat ladies), 55 (musty hive), 49 (PC), 36 (three dozen), 21 (key of the door), and 16 (never been kissed). Unfortunately, some cultural favourites including 69 and 22 have not been included! Those of you that are either unacquainted with bingo or have never played the game will really be scratching your heads right now. On a sidenote, bingo is a great game to play so check out the rules! The Bingo Caller is Wild... and Creepy! The Wild symbol is represented by a rather creepy looking bingo caller. It could be argued that this representation is very true to life. No offence to any creepy looking bingo callers. It substitutes for all other symbols, except Scatters, to complete any potential winning combinations that appear on the reels. Trigger up to 20 (One Score) Free Spins! The Bingo Billions! logo acts as the Scatters on this slot. If you hit two or more of them across the reels you will win a Scatter payout. 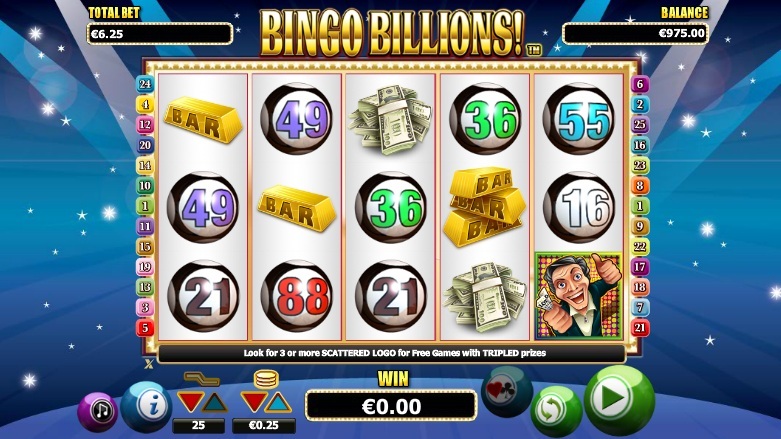 However, if you hit three or more of the Scatters across the reels you will win up to 20 free spins. Additionally, all wins achieved during the free spins are subjected to a 3x multiplier. This slot is once again victim to the lack of adventure from NextGen Gaming. It is a simple 25 payline format with Wilds, Scatters, and free spins but not a lot else. Bingo fans will enjoy playing a bingo-themed slot. Unfortunately, I'm not sure this will appeal to anyone else. It has a game show feel to it so those of you that enjoyed the underwhelming 100,000 Pyramid slot from IGT and the vintage 3-2-1 slot by Endemol Games might find some amusement in it but it really is a slot that will fail to find a target market if you ask me.